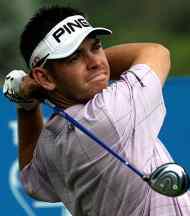 Louis Oosthuizen established himself among the golf elite when strolling to a comfortable victory in the 2010 Open Championship. The South African was supported financially for three years by the foundation of Ernie Els and won numerous amateur titles before turning professional in 2002. His first professional victory came at the 2004 Vodacom Origins of Golf Tour event at Arabella, the first of seven wins on the Sunshine Tour. In 2007 he won the Dimension Data Pro-Am, the Platinum Classic and the Telkom PGA Championship twice. He successfully defended the Telkom in 2008 and won the Africa Open in 2011 and 2012. Oosthuizen has been a member of the European Tour since 2004, giving notice of his emergence when finishing 31st in the Race to Dubai in 2009. He claimed his first European Tour event the following March at the Open de Andalucia de Golf but it was his performance at the British Open at St Andrews that brought him to the attention of the world’s media. Oosthuizen started the tournament ranked 54th in the world and no more than a respected outsider. He had previously made only one cut in eight major championship appearances and an opening 65 left him two shots behind leader Rory McIlroy. If anyone thought this was a flash in the pan, they were in for a shock as the South African followed up with a low round of 67 on the Friday to take the outright lead. His two-day total of 132 equalled the previous record for an Open Championship at the course. Loius Oosthuizen had already established himself as a good “front-runner” and he never gave any sign that he was likely to capitulate. A combination of unerring accuracy and sublime putting produced a 69 in round three and gave him a four-stroke lead to defend on the final day. Englishman Paul Casey was his closest pursuer but he never got closer than three behind as Oosthuizen remorselessly ground out a final round 71 for an emphatic seven shot victory. His final score of 272 was the second lowest in St Andrews history and he became the fourth South African champion after Bobby Locke, Gary Player, and Ernie Els. It also catapulted him to number 15 in the official World rankings. Oosthuizen ended 2010 in 10th place on the Race to Dubai following three more top-10 finishes. In January 2011 he won the Africa Open in a playoff, a title which he successfully defended in 2012, aided by a second round 62. He produced another excellent performance at a Major tournament when finishing runner-up in the 2012 Masters at Augusta. An albatross on the second hole, only the fourth in Masters history, took Oosthuizen to the outright lead but Bubba Watson forced him into a playoff. He lost on the second hole of a sudden-death playoff but bounced back for his fifth European Tour title at the Maybank Malaysian Open. In the 2012 Deutsche Bank Championship, Oosthuizen again came close to a first victory on American soil when finishing second to Rory McIlroy. He reached the top 10 of the Official World Golf Rankings for the first time that year and was also third in the Race to Dubai. He started 2013 with a one-stroke victory in the Volvo Golf Champions after a final round 66, having pulled back five shots on the overnight leader Scott Jamieson. He is clearly going to be a force to be reckoned with in all the major events this season.